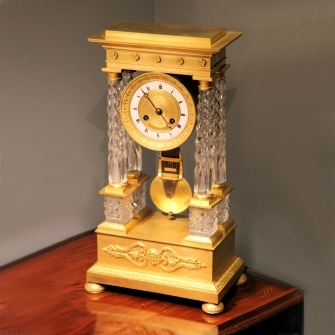 A very beautiful early French mantel clock. The eight day duration circular movement with solid Dead-beat escapement and true 'Gridiron' temperature compensated pendulum. Also, countwheel striking the hours and halfs with a block hammer on a tuned bell. Enclosed within a drum with back cover and behind a 3 1/2" diameter, white enamel chapter ring with black Roman numerals and minute ring, applied to a finely engine-turned ormolu dial and set within a well cast, ormolu bell-flower and bead decorated bezel. Also having Brocot 'Open moon' matching blued steel hands. The classical Portico four pillar style case having its original fire gilding. The pediment having a moulded cornice and rosette applications and held aloft by the cut crystal pillars with ormolu Doric capitals which in turn are mounted upon square section glass blocks again, with ormolu tops and bases. These in turn are sat upon the four corners of the base with front Anthemion and female head mount. This has a plinth with acanthus moulding and four ornate circular feet. * Portico clocks with crystal pillars in good condition are far and few between. This example was never intended to be placed within a glass dome and the condition of the original gilding is exceptional. Dimensions: 16 1/4" high x 9" wide x 5 1/2" deep. Condition: Excellent. In particular, the dial and gilding.